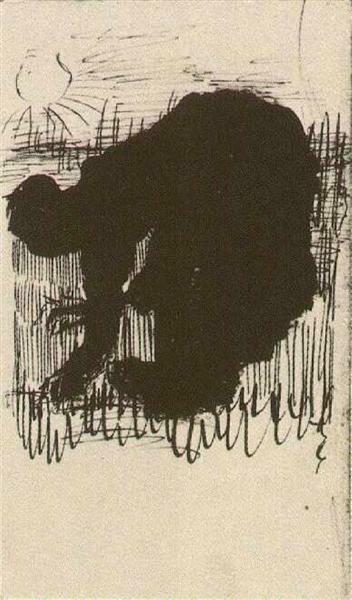 Silhouette of a peasant woman digging carrots, by Vincent van Gogh, 1885, Van Gogh Museum, Amsterdam, Netherlands (via WikiPaintings). Experts working at the interface of climate change and agriculture are gathering at two venues in California this week to do the impossible: find ways to do ‘climate-smart agriculture’, specifically—use science to feed more of the world’s growing population and reduce world poverty while mitigating agriculture’s environmental harms the greenhouse gas emissions that are warming the Earth. First up is a CGIAR group looking to work better, with faster impacts, through so-called ‘social learning’. On Mon and Tue, 18–19 Mar 2013, the CGIAR Research Program on Climate Change, Agriculture and Food Security (CCAFS) is holding its annual science meeting, in Bodega Bay. This group of 70 or so people is Rethinking Science, Learning and Partnerships to Meet Development Outcomes: Reducing Poverty and Improving Food Security in the Context of Climate Change. This CCAFS meeting is looking for ways to achieve better, bigger and faster impacts through engagement with a wide variety of communities. The participants see untapped potential in CGIAR and beyond for actors of diverse kinds to join forces in improving global food security in the light of climate change. They’re looking at innovative ways to democratize and co-create science for practical use. They hope to build on a legacy of social learning approaches and participatory work within CGIAR and to find ways to adapt these to address the complex challenges faced by hundreds of millions of small-scale food producers and sellers in developing countries. Updates from the event are being shared on the CCAFS website and on Twitter (follow #2013CCSL). For more information, go to CCAFS 2013 Science Meeting programme. Among the CCAFS participants coming from the International Livestock Research Institute (ILRI), in Nairobi, Kenya, are Philip Thornton, James Kinyangi, Mariana Rufino, Polly Ericksen, Wiebke Foerch, Maren Radeny and Ewen Le Borgne. 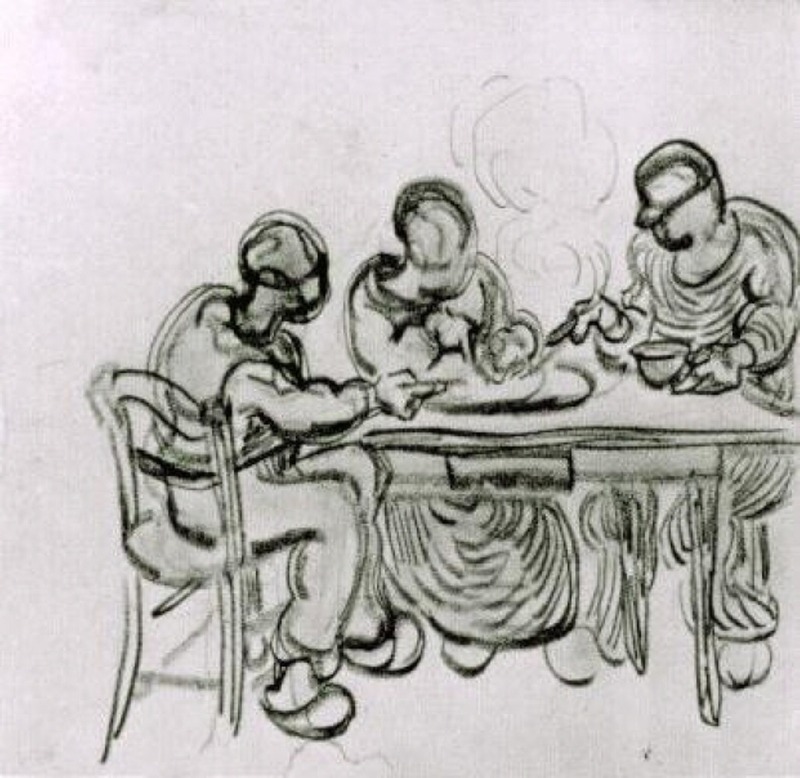 Three peasants at a meal, pencil sketch and study by Vincent van Gogh, 1890, Van Gogh Museum, Amsterdam, Netherlands (via WikiPaintings). Following the Bodega Bay meeting, a larger group of climate change and agricultural experts will meet at the University of California at Davis from Wed through Fri, 20–22 Mar 2013, for a global science conference on Climate-Smart Agriculture (and here). With climate change occurring more rapidly than anticipated, an increase in extreme weather events is threatening global agriculture and food supplies. Existing technologies and institutional structures will be insufficient to slow climate change while feeding the growing human population sustainably. Participants at this conference will work to identify useful actions that are science-based, to use knowledge systems in new ways and to help strengthen the resilience of agricultural communities facing an uncertain future. They’ll look at new ways of integrating science and policy to transform land management and community action for food security. The overall aim is to link agricultural sciences with policies and practices so as to ensure a triple bottom line: food security, poverty alleviation and ecosystem services. Many CCAFS staff will be participating in, or organizing sessions at, this conference as well. For more information, visit the UC Davis website.